Our supply chain is built on our domestic and overseas logistics network. It provides parts procurement for customers in wide range of industries, starting from automotive to consumer goods and industry equipment. To ensure a stable supply to our customers’ manufacturing sites in various countries, we have a unique crisis management system that verifies impact on our supply chain in the event of a catastrophe and reports to our customers at the earliest moment. 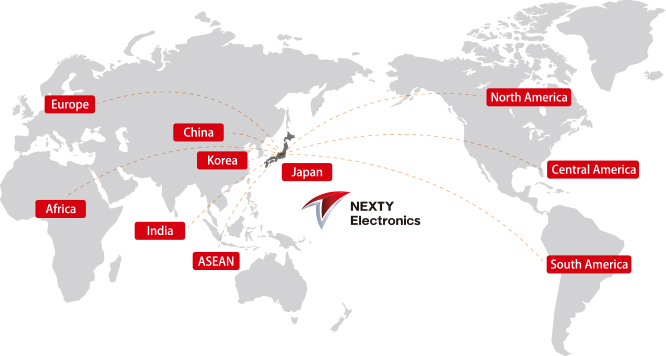 Furthermore, to handle a dynamic demand fluctuation, we set up warehouses for electronics parts in our overseas locations. We also equip our domestic and overseas sites to manage inventories, incoming and outgoing orders. In the future, we expect to improve efficiency of our logistics with economies of scale. We will expand our supply chain to emerging countries with increasing procurement demands. Also, we actively incorporate cutting-edge technology such as the smart logistics to achieve a new logistics service. We also provide efficient logistics services by leveraging economies of scale.